Comments Off on When is The Best Time to Replace or Revamp Your ERP Software System? When times get hard, and they inevitably will with the ebb and flow of success in the business world, many businesses begin to evaluate their work processes to find any areas in need of improvement. That inevitably leads them to their ERP/accounting software systems, which may or may not be up to their standards. Far too many of those companies installed ERP systems they hoped would turn their companies around only to suffer through the financial burden of implementation with no quantifiable benefits. When they hit such a wall, they often pack up and look for a new ERP system, starting the process all over again. Without a doubt, there are situations where businesses have been hanging on to legacy ERP systems for years, and an upgrade or completely new system just makes sense. When that is not true, however, it is best to step back and ask yourself a couple questions about your ERP system and your business in general. Is your ERP system really the problem? - While it can be a convenient scapegoat, you may be missing the bigger picture. If you are going to evaluate your ERP software, you also should evaluate how your business uses it and how effectively your employees utilize its resources. Is your ERP system current? - It might have held up the world in 1995, but the rest of the world has moved on and upgraded several times since then. Many of your problems may stem from the lack of compatibility with your more current software and the outdated tools that do not fit current business trends. You may be due for an upgrade rather than a replacement. It is sometimes difficult to know when the time is right for change, and actually reaching the point where you take the first step toward change can be daunting. REACH-Solutions can help. Since 1995 REACH-Solutions has assisted Arkansas businesses to navigate the complex process of selecting and implementing business management software. We can give you an honest evaluation of your current system and processes and recommend that first step. Or if you are using an outdated version of Microsoft Dynamics GP, Microsoft Dynamics SL or Microsoft Dynamics RMS we can help you get the most out of your existing system with the current version. 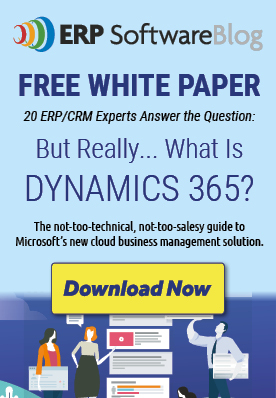 Posted in About Microsoft Dynamics GP, About Microsoft Dynamics SL, Accounting Software Selection Tips | Comments Off on When is The Best Time to Replace or Revamp Your ERP Software System?